Local Scholarships – Cops & Doctors & Architects, Oh My! 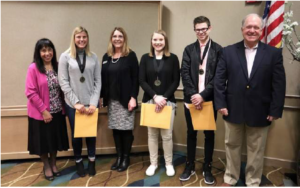 The Coeur d’Alene Chamber of Commerce held its annual “Scholars Breakfast” in April, celebrating the top students from the five area high schools. Three $1,000 scholarships, provided by Spokane Teachers Credit Union, North Idaho Consortium for Higher Education (NIHE) and Coleman Engineering, were awarded. Nineteen students competed for the scholarships through an application process requiring a written essay about their plans for the future, grade point standing, references, and a resume. The 2018 recipients were Zackary Bullock and Abbigail Shrontz from Coeur d’Alene High School, and Maya Zollman from Coeur d’Alene Charter Academy. The fields of study the scholarship winners plan to pursue is diverse: Architectural Engineering (Bullock), Biomedical Engineering & Pre-Med (Shrontz), and Law Enforcement (Zollman). There are approximately 50 LOCAL scholarships available annually to North Idaho graduates funded by civic groups, businesses, and other institutions that are (typically) awarded to students who to plan to attend North Idaho colleges. As with the Coeur d’Alene Chamber Scholarship opportunity, oftentimes GPA is only ONE factor in the decision-making process.